The Lake Experience for much less! Book Now, rate increase 4/1/2019! Sister Lakes, 4 bedroom, 3 baths, sleeps 8 comfortably. Updated and Remodeled. Our property is available for 2019 winter rental for visiting snow mobilers and cross country skiers. We also offer winter rental by the month, January-April. Updated 2019 seasonal rent begins on May 1st. Beat the rent increase and reserve before May 1 for 2018 prices. The Smith House on Apple Lane sits on 1 acre in Pitcher Subdivision, just a short walk from beautiful Round Lake. We are within walking distance to all of Sister Lakes. Bring or rent a boat, jet skis, canoe, paddle boats, etc and launch at the Public Access. Walk to the access for swimming. 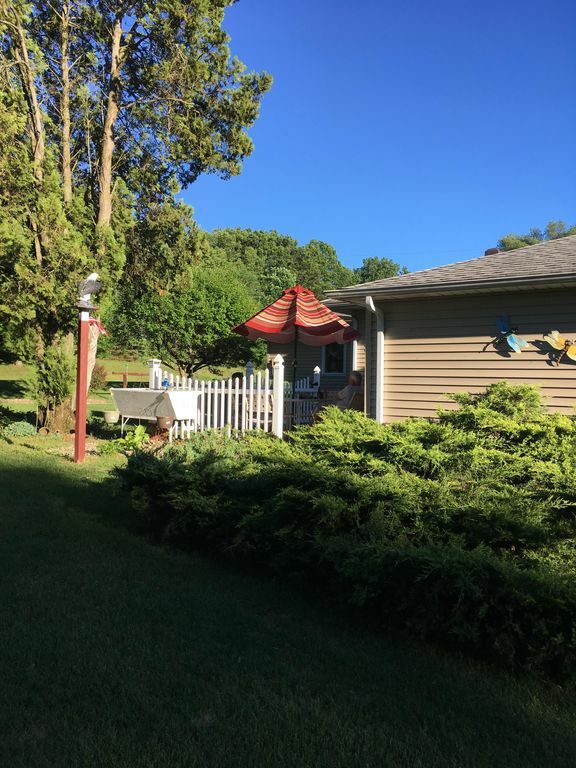 Before or after a day on the water, relax on the patio, enjoy the beautifully landscaped shade gardens, the birds and butterflies, occasionally see rabbits frolic in the spacious back yard property. Play corn hole while you are grilling out. Go for a bike ride and visit all that Sister Lakes has to offer. You can also get to Lake Michigan in a jiffy, and the beaches there are certainly worth your time in driving to them. Our home was totally remodeled in 2016 w beautiful wood floors, updated appliances, modern bathrooms, a full basement, 2 big screen televisions, and new furniture in both the upstairs and downstairs living rooms. You can certainly have the Sister Lakes experience from our home for so much less in rent. Eating Establishments-Captain Jack's, The Strand, Dockside Dan's, Driftwood, El Supermercado, Lakeview Inn, Sweet Things, Wrights. Yes, we are in a rural area. Lots of fruit and vegetable farms. You must check out Sprague's Family Fun Farm. Any produce in season, you will find here and grown locally. Excellent!!!! There are extra sheets provided if you want to make up the sectional in basement. It would accommodate 2 people comfortably. The regular wash cycle is loooong. I use the quick wash on most loads, and tap cold water setting. Our driveway will accomodate 2 vehicles wout problem. And wash cloths. Bring your own beach towels. 2 drawer under the counter upstairs. Full fridge/freezer w ice maker in laundry room downstairs. keurig must purchase keurig coffee pods, available at Sister Lakes Dollar General. Must use bottled water in the keurig. Gallons of water also available at $General. I try and stock paper towels, dish soap, dishwasher soap, toilet paper, enough for your stay. You are staying in a rural, resort area away from the hustle and bustle of city life! Bike or walk through Sister Lakes area. Miniature golf next to Ramona Roller Rink. The Sister Lakes Brewery has fun trivia nights among other special happenings. The Strand is great lakeside dining. Driftwood is a special shop w souvenirs, pinball and video games, and ICE CREAM for eating on lakeside patio. Dockside Dans right next door. Lots to do and within walking distance or a 5 minute drive away. And don't forget Lake Michigan beaches are only 27 minutes away! No boat, ,no problem! Rent a boat from Lake Effect Power Sports, right up the road, across from Sister Lakes El. J.D. 's Marina (formerly Midway Marine) is about 5 min away. Yes, we take pride in keeping our home clean and tidy for our guests. We are regularly reviewing how to make it even more accommodating and comfortable for next season. Yes, we also agree that the patio is pleasant as long as the weather cooperates. Even in summer heat, the patio offers a pleasant place to have coffee and enjoy the morning birds......in the evening a perfect place for grilling out and or just "chilling". On behalf of my mom and family, I will certainly do my best to accommodate our guests. That's a commitment I take very seriously. This property was a PERFECT fit for our needs!! The number of bedrooms and bathrooms, and how they lay out within the house is just marvelous. The surrounding community is lots of fun, and its citizens are wonderful characters. I only wish we had enough time to wet a line in one of the lakes. So happy to hear that our guests are pleased and very satisfied with the spaciousness of our home. The finished basement does allow for another complete living space separate from the upstairs. Having 3 full bathrooms is definitely a plus for big families or many friends wishing to vacation together. Yes, Sister Lakes is certainly unique in what it has to offer as a vacation spot. If you've never been, check out my vrbo site for more information on restaurants, boating, beaches, shopping, wineries, breweries, golfing. Sister Lakes is very much a part of "Pure Michigan"! We had a great stay!!! I would absolutely recommend staying here. We hope to be back soon!! "We will be back soon!" Yay! In appreciation to our guests from our inaugural season, we offer the same low, rental night fee for return visits from now through the end of 2019. This also is offered to any friends or family of our first timers! Its just one way of saying thanks for giving us a try and please come back. We are newbies in the VRBO world and have learned so much as to how we can make it even better for our guests. Please check back often as I continually update our site. Summer is coming to a close but Fall is a beautiful time of the year in our area, we are talking beautiful fall color!!!!!!!!!!! very relaxing place to stay. the house is very clean and comfortable. neighborhood is quiet and peaceful. will surely come back for another vacation. Again, we love to hear that our guests would like to make a return visit. We'd like to offer our first season guests the same low, nightly fee offered this season. So come on back in 2019 with no rate increases in nightly fees. So glad you were able to relax and enjoy yourselves in our home and that it met all of your expectations! The house was comfy and spacious! We love to hear that our home was a great fit for our guests. We do offer 2 complete and separate living spaces in addition to 3 full bathrooms for a very low nightly fee. We are not on the lake but within walking distance. You are able to have the Sister Lakes experience for much less! My sisters and I take a trip together each summer. This year we ended up in the Sister's Lake area, which came up when I searched for VRBO properties in Benton Harbor. The house was a little farther away from Lake Michigan than I originally hoped for, but we ended up loving the area. The house was very welcoming and roomy. We loved that we each had our own bedroom and a bathroom to ourselves. Everything was well thought out and planned for guests to be comfortable. There was even a box of games and cards; we enjoyed several hours of Chinese Checkers and Nerts! We laughed a lot and really enjoyed our time together. Property managers were friendly, helpful, and prompt. I would recommend the Smith House on Apple Lane to others! The only reason I did not give it 5 stars was the lack of internet/wifi, which we really wished we would have had. But being "unplugged" wasn't really a hindrance to our fun at all! We are delighted to know that our guests are getting together at our home for "time away from it all". Yes, Silver Beach in St Joe is 16.7 miles from our house in Sister Lakes. Growing up, we traveled that distance so often that it wasn't a big deal to us. I understand that visitors to the area might think it far. Personally, I feel when you have the spacious and upgraded accommodations plus the proximity to all of Sister Lakes that our home has to offer, for so much less than you could ever get on any of the lakes; it becomes somewhat of a trade off. We do not advertise as having wifi and frankly can't afford any more overhead depleting our profit. I know this could be a deal breaker for some, however, I appreciate the "unplugged" comment from this guest. We have many fine wineries in the area, within a 30 minute or so, drive . Lemon Creek (27 min drive), The Round Barn (33 min) are just a couple. Want more or need addresses, contact me and I will set you up. We have 2 local, and new last season, Breweries. Sister Lakes Brewery and The Strand. We love them both!!! You could even walk to them, contact me and I'll give you my shortcut! Check out Spragues Family Fun Farm, (11 min drive) for all the fresh produce you can imagine; plus home baked cakes and pies.........to die for. They also carry beef of all cuts, the best steaks ever from a well known Chicago butcher!!! Who needs a grocery store when you can go straight to the farm!!!! How about visiting a Petting Farm?! We have one, Hidden Acres, and its only a 9 min drive away! Don't forget roller skating and minature golf, right in the heart of Sister Lakes. And there's even a drive-in movie theater at 5 mile Corner. (M-152 & M-51) What are your interests? Let me know and we can most likely make it happen in our area!